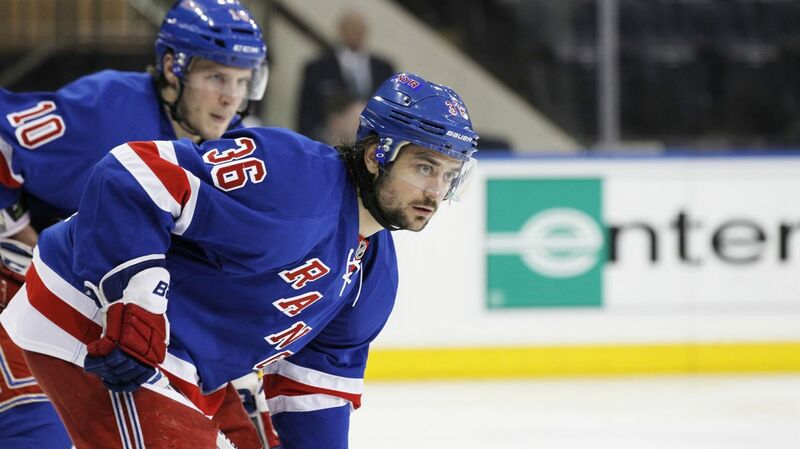 Mats Zuccarello will be back in a Rangers jersey tonight. Photo courtesy of MSG Photos. The Rangers and GM Jeff Gorton have announced that the team has assigned 19 of their training camp invitees. Twelve of the players will report to the Hartford Wolf Pack’s training camp: Calle Andersson, Kodie Curran, Cedrick Desjardins, Samuel Noreau, Mackenzie Skapski, Michael St. Croix, Nick Tarnasky, and Petr Zamorsky. Six of the players will report back to their respective Junior hockey teams: Ryan Gropp, Brandon Halverson, Keegan Iverson, Tyan Mantha, Brad Morrison, and Sergey Zborovskiy. Jacob Smith was released from his tryout agreement. The first round of cuts/reassignments is only the beginning of the roster assignments that will occur throughout training camp and preseason. According to Alain Vigneault, the Rangers will cut down to six lines and around nine to 11 defenseman, as reported by Steve Zipay. Vigneault also stated that the Rangers will keep just 13 forwards, which is standard, but he’s still undecided on seven or eight defensemen. It all comes down to money. That means that there could an increased chance of Dylan McIlrath or Brady Skjei make the team. Kevin Hayes will play again tonight and he will remain at center following a pretty poor performance at that position on Tuesday. AV said that playing Hayes at the wing is “still an option.” Hayes’ final positioning, whether it be at center or on the wing, plays a major part in how this team will be structured. Mats Zuccarello will be one of the Rangers making their debut tonight, returning to the ice in a Rangers sweater for the first time since his head and brain injury in April in the series against the Penguins. Vigneault said that his shifts would be kept short, and he said, “I just want Zucc to have fun tonight.” He will be skating alongside his old linemates Rick Nash and Derick Brassard, who are also making their debuts. On defense, Ryan McDonagh and Dan Boyle will be making their first appearances of the preseason. McDonagh is healthy after sustaining a broken foot against the Tampa Bay Lightning during the Eastern Conference Finals, while Boyle is playing his first game after having to deal with a family issue earlier in the week. Also making his preseason debut is young center Adam Tambellini, one of the more intriguing prospects in the Rangers organization. 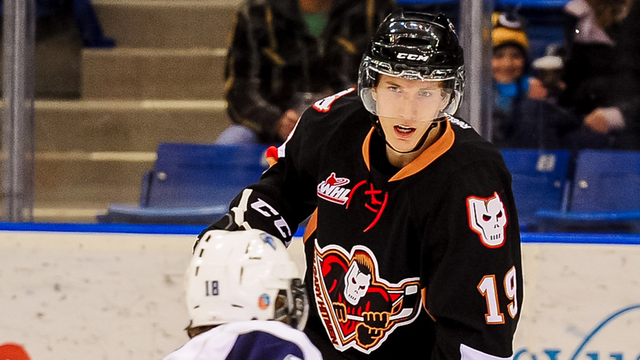 This past season, as an alternate captain for his WHL team, the Calgary Hitmen, Tambelli totaled 86 points (47-39-86) in just 71 games, adding another 13 goals and 26 points in 16 playoff games. I think he has what it takes to be a top two center one day, and I’m excited to watch him play. Photo courtesy of Steve Hiscock/Saskatoon Blades. Henrik Lundqvist will start in his first preseason game, playing the first two periods before Jeff Malcoml takes over. If you want to read more direct quotes and get an idea about what Vigneault may be thinking, check out this article (LINK) from Steve Zipay, and follow him on Twitter @stevezipay. Posted on September 24, 2015, in Game Previews and tagged Alain Vigneault, Ban Boyle, Brian Gibbons, Derick Brassard, Emerson Etem, Jarret Stoll, Kevin Hayes, Mats Zuccarello, McDonagh Injury, New York Rangers, New York Rangers blog, NHL, NHL preseason, NYR, Oscar Lindberg, Rangers, Rangers blog, Rick Nash, Ryan McDonagh, Tanner Glass, Viktor Stalberg, Zuccarello injury. Bookmark the permalink. Leave a comment.